Nine female pilots at Naval Air Station Oceana in Virginia say they felt privileged to have been selected as volunteers to perform the “missing woman” formation on Saturday for an aviator who paved the way for their success, retired Navy Capt. Rosemary Mariner, reports Military.com. Mariner died last week at 65. 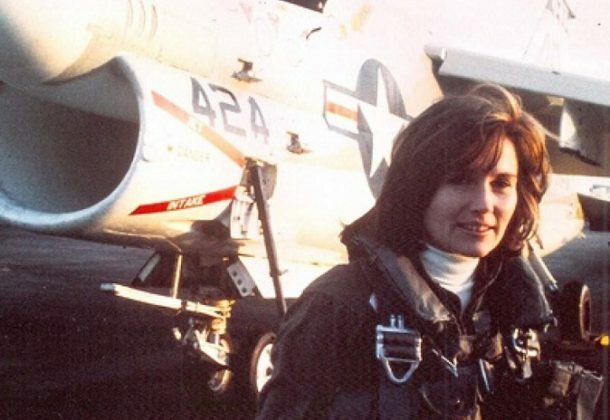 She was the Navy’s first female jet pilot, according to her obituary. German officials said the F-35 will not be in the running to replace the Tornado fleet, Defense News reports. It is believed that the Eurofighter Typhoon is the favored upgraded version. Northrop Grumman will build five long-range MQ-8C Fire Scout unmanned helicopters for operation surface warships under terms of a $55.1 million US Navy contract, reports Military & Aerospace Electronics. From 2011 to 2013, the MQ-8B performed ISR missions for special operations forces in northern Afghanistan, capturing several hundred hours of full-motion video surveillance per month, reports Rotor & Wing. The Navy moved forward with its decision to buy two aircraft carriers at one time. Huntington Ingalls was awarded a $14.9 billion contract for two Ford-class carriers, reports Defense News. The next Navy Independence-class littoral combat ship will be named in honor of Maine’s state capital, Augusta, reports The Associated Press. Navy Secretary Richard Spencer said Maine has been an important part of the Navy and Marines through every conflict. The Trump administration said it will suspend its obligations under a decades-old Cold War arms control pact with Russia, citing Moscow’s violations of the treaty, reports The Hill. Three hundred and twenty-one active-duty service members took their lives during 2018, including 57 Marines, 68 sailors, 58 airmen, and 138 soldiers, reports Military.com. The deaths equal the total number of active-duty personnel who died by suicide in 2012, the record since the services began closely tracking the issue in 2001. Executive.gov reports a new report shows Veterans Affairs failed to meet the required savings and cost avoidance during its data center consolidation efforts in fiscal 2018. The agency did not meet the $85.3M target set by the Office of Management and Budget, according to the report. NAWCAD Vice Commander Capt. Craig Lee recently honored employees from the research, engineering, test, and evaluation departments at NAS Pax River for 25 to 50 years of service, reports The Tester. Military Times Service Members of the Year awards honored outstanding military members from each branch of service. Meet Craig Humes, a Navy hospital corpsman first class, who earned Sailor of the Year honors in 2018 in a Navy Times interview. There’s still time to make a nomination for the 2019 awards. Click here to nominate someone. Northrop Grumman Systems Corp., Aerospace Systems, Melbourne, Florida, is awarded $11,278,884 for cost-plus-fixed-fee order N0001919F2667 against a previously issued basic ordering agreement (N00019-15-G-0026). This order provides for aerial refueling envelope expansion and objective tanker qualification testing in support of the E-2D Advanced Hawkeye aircraft. Work will be performed in Patuxent River, Maryland (75 percent); and Melbourne, Florida (25 percent), and is expected to be completed in January 2021. Fiscal 2019 research, development, test and evaluation (Navy) funds in the amount of $4,000,000 will be obligated at time of award, none of which will expire at the end of the current fiscal year. The Naval Air Systems Command, Patuxent River, Maryland, is the contracting activity. Huntington Ingalls Industries – Newport News Shipbuilding, Newport News, Virginia, is awarded the detail design and construction (DD&C) efforts for nuclear-powered aircraft carriers Enterprise (CVN 80) and unnamed CVN 81 under the following contract actions: (1) A $14,917,738,145 fixed-price-incentive-firm target modification to previously awarded contract N00024-16-C-2116 for DD&C efforts for the future USS Enterprise (CVN 80) and unnamed CVN 81. The current contract for advance procurement funded efforts has been in place since 2016. (2) A $263,096,868 cost-plus-fixed-fee modification to previously awarded contract N00024-16-C-2116 for associated research and development efforts. (3) A $31,097,671 cost-plus-fixed-fee modification for additional level-of-effort in support of maintenance of the CVN 78 class specification, design efforts, feasibility and tradeoff studies, and scoping and estimating. Work under this contract will be performed in Newport News, Virginia (62 percent); Sunnyvale, California (5 percent); Coatesville, Pennsylvania (3 percent); Wellsville, New York (1 percent); Cincinnati, Ohio (1 percent); Milwaukee, Wisconsin (1 percent); and various locations below one percent (27 percent), and is expected to be completed by February 2032. Fiscal 2018 and 2019 shipbuilding and conversion (Navy) funding; and fiscal 2019 research, development, test and evaluation (Navy) funding in the amount of $889,830,279 will be obligated at time of award and will not expire at the end of the current fiscal year. This contract was not competitively procured, in accordance with Federal Acquisition Regulation 6.302-1(a)(2)(iii) – only one responsible source and no other supplies or services will satisfy agency requirements. The Naval Sea Systems Command, Washington, District of Columbia, is the contracting activity. AECOM Construction Inc., Arlington, Virginia (N40085-19-D-9066); Archer Western Federal JV, Chicago, Illinois (N40085-19-D-9067); Hourigan Construction Co., Virginia Beach, Virginia (N40085-19-D-9068); RQ Construction LLC, Carlsbad, California (N40085-19-D-9069); The Whiting Turner Contracting Co., Greenbelt, Maryland (N40085-19-D-9070); and W.M. Jordan Co. Inc., Newport News, Virginia (N40085-19-D-9089), are each awarded an indefinite-delivery/indefinite-quantity, multiple-award design-build/design-bid-build construction contract for construction projects, located primarily within the Naval Facilities Engineering Command (NAVFAC) Mid-Atlantic Hampton Roads area of responsibility (AOR). The maximum dollar value for all six contracts combined is $249,000,000. The work to be performed provides for but is not limited to, new construction, renovation, alteration, demolition, and repair work for industrial, warehouses, airfield, aircraft hangar, aircraft traffic control, infrastructure, administrative, training, dormitory, recruit barracks, mess facilities, assembly facilities, medical facilities and community support facilities. AECOM Construction Inc. is awarded the initial task order at $27,640,890 for the design and construction of a new bachelor enlisted quarters at Naval Weapons Station Yorktown, Virginia. The task order also contains three planned modifications, which if exercised would increase cumulative contract value to $29,272,575. Work for this task order is expected to be completed by May 2021. All work on this contract will be performed in the NAVFAC Mid-Atlantic Hampton Roads AOR, Virginia. The term of the contract is not to exceed 60 months, with an expected completion of January 2024. Fiscal 2018 military construction (Navy) contract funds in the amount of $27,640,890 are obligated on this award and will not expire at the end of the current fiscal year. Future task orders will be primarily funded by operations and maintenance (Navy); and military construction (Navy). This contract was competitively procured via the Navy Electronic Commerce Online website, with 18 proposals received. These six contractors may compete for task orders under the terms and conditions of the awarded contract. NAVFAC Mid-Atlantic, Norfolk, Virginia, is the contracting activity. Hamilton Sundstrand Corp., Windsor Locks, Connecticut, is awarded a $27,705,545 cost-plus-fixed-fee, indefinite-delivery/indefinite-quantity contract in support of engineering services and on-site support services to explore and resolve issues associated with various submarine air revitalization, monitoring, oxygen generation and ventilation systems on U.S. naval ships. Work will be performed at various locations including New London, Connecticut; Philadelphia, Pennsylvania; Norfolk, Virginia; Kings Bay, Georgia; San Diego, California; Bremerton, Washington; Pearl Harbor, Hawaii; and Norway, and is expected to be completed by January 2024. Fiscal 2019 operations and maintenance (Navy) funding in the amount of $29,081 will be obligated at time of award on the initial task order and will not expire at the end of the current fiscal year. This contract was not competitively procured, in accordance with 10 US Code 2304(c)(1) – only one responsible source and no other supplies or services will satisfy agency requirements. The Naval Surface Warfare Center, Philadelphia Division, Philadelphia, Pennsylvania, is the contracting activity (N64498-18-D-4000). Northrop Grumman Systems Corp., Herndon, Virginia, is awarded a $17,774,920 firm-fixed-price modification to previously awarded contract N00024-17-C-6327 to exercise options for the Joint Counter Radio-Controlled Improvised Explosive Device Electronic Warfare Increment One Block One Systems full-rate production in support of the Expeditionary Warfare Program Office. Work will be performed in San Diego, California, and is expected to be complete by November 2020. Fiscal 2019 and 2018 Overseas Contingency Operations other procurement (Navy); and 2018 other procurement (Navy) funds in the amount of $9,967,278 will be obligated at time of award and not expire at the end of the current fiscal year. The Naval Sea Systems Command, Washington, District of Columbia, is the contracting activity. Progeny Systems Corp., Manassas, Virginia, is awarded a $14,750,184 cost-plus-fixed-fee contract to deliver the Integrated Shipboard/Shore-based Maintenance Management Decision Tool and related engineering and technical services via the Nosis software infrastructure and build process. This effort will produce, deliver and support continuously updated Nosis functionality in a common software build to Virginia, Columbia, Los Angeles, Ohio, and Seawolf submarines, as well as aircraft carrier propulsion plants. This contract includes options which, if exercised, would bring the cumulative value of this contract to $85,654,305. Work will be performed in Manassas, Virginia (30 percent); Groton, Connecticut (25 percent); Bremerton, Washington (15 percent); Las Vegas, Nevada (10 percent); Cleveland, Ohio (10 percent); Chesapeake, Virginia (4 percent); Pearl Harbor, Hawaii (2 percent); San Diego, California (2 percent); and Kings Bay, Georgia (2 percent), and is expected to be complete by January 2020. Fiscal 2019 research, development, test and evaluation; fiscal 2014 and 2015 shipbuilding and conversion (Navy); and fiscal 2019 other procurement (Navy) funding in the amount of $14,318,371 will be obligated at time of award and will not expire at the end of the current fiscal year. The Naval Sea Systems Command, Washington, District of Columbia, is the contracting activity (N00024-19-C-6204). Treadwell Corp., Thomaston, Connecticut, is awarded a $9,381,592 cost-reimbursable, indefinite-delivery/indefinite-quantity contract in support of engineering and in-service engineering services for submarine air revitalization, air monitoring, oxygen generation and ventilation on U.S. naval ships. Work will be performed at various locations worldwide including New London, Connecticut; Philadelphia, Pennsylvania; Norfolk, Virginia; San Diego, California; Bremerton, Washington; Guam; Diego Garcia; and Pearl Harbor, Hawaii, and is expected to be completed by January 2022. Fiscal 2019 operations and maintenance (Navy) funding in the amount of $35,503 will be obligated on the first task order placed at time of award and will not expire at the end of the current fiscal year. This contract was not competitively procured, in accordance with 10 US Code 2304(c)(1) – only one responsible source and no other supplies or services will satisfy agency requirements. The Naval Surface Warfare Center, Philadelphia Division, Philadelphia, Pennsylvania, is the contracting activity (N64498-18-D-4003). AKIMA Logistics Services LLC, Herndon, Virginia, has been awarded a $7,798,197 firm-fixed-price option indefinite-delivery/indefinite-quantity contract for full contractor logistics support of 58 US Air Force Academy aircraft. Work will be performed at the US Air Force Academy, Colorado Springs, Colorado; Peterson Air Force Base, Colorado; and the US Air Force Academy auxiliary airfield, and is expected to be completed by Jan. 31, 2020. Air Force Life Cycle Management Center, Tinker Air Force Base, Oklahoma, is the contracting activity (FA8106-19-F-8001). Marton Technologies Inc., Newport News, Virginia, was awarded a $15,962,505 modification (0001 73) to contract W52P1J-14-G-0021 for logistics support services. Work will be performed in Fort Riley, Kansas, with an estimated completion date of Jan. 31, 2020. Fiscal 2019 operations and maintenance, Army funds in the amount of $13,483,212 were obligated at the time of the award. US Army Contracting Command, Rock Island Arsenal, Illinois, is the contracting activity. Loch Harbour Group Inc., Alexandria, Virginia, was awarded a $7,247,076 modification (P00010) to contract W9124L-17-F-0003 for training instructors. Work will be performed in Fort Sill, Oklahoma, with an estimated completion date of Oct. 31, 2022. Fiscal 2019 operations and maintenance, Army funds in the amount of $7,247,076 were obligated at the time of the award. US Army Mission and Installation Contracting Command, Fort Sill, Oklahoma, is the contracting activity. NetCentrics Corp., Herndon, Virginia, has been awarded a $268,464,985 firm-fixed-price contract to provide Information Technology (IT) Support Services – Service Delivery. The specific tasks of this service delivery requirement will consist of satisfying Joint Service Provider (JSP) user needs for secure, accessible, and stable IT support. Service delivery services requires an understanding of the current operating environment of the JSP and the ability to leverage mature capabilities and industry best practices to improve efficiency and reduce complexity in order to enhance JSP’s IT support services. Through the Service delivery requirement, the JSP seeks to deliver responsive IT services and support to its users in the most efficient manner as possible. Work performance will take place primarily in the National Capital Region, including the Pentagon, Mark Center, and Crystal City, Virginia. Fiscal 2019 operations and maintenance funds in the amount of $268,464,985 are being obligated on this award. The expected completion date is Feb. 27, 2023. Washington Headquarters Services, Arlington, Virginia, is the contracting activity (HQ0034-19-F-0093). ARTEL LLC, Herndon, Virginia, was awarded a contract modification (P00005) with an effective date of Feb. 2, 2019, to exercise Option Period One on task order GS-35F-5151H / HC101318F0016 for commercial satellite communications service. The face value of this action is $12,253,244 funded by fiscal 2019 operations and maintenance funds. The total cumulative face value of the task order is $77,474,994. Performance directly supports the Air Force’s Central Command network architecture within the Southwest Asia area of responsibility. Quotations were solicited via the General Services Administration’s Federal Supply Schedule, Information Technology Schedule 70, and one quotation was received from 29 offerors solicited. The period of performance for Option Period One is Feb. 2, 2019, through Feb. 1, 2020, and there are three remaining unexercised option periods for this task order. The Defense Information Technology Organization, Scott Air Force Base, Illinois, is the contracting activity. Andromeda Systems Inc., Virginia Beach, Virginia, is awarded a $41,977,403 indefinite-delivery/indefinite-quantity contract to provide engineering support services and associated engineering technical services in support of the Fleet Readiness Center South East’s In-Service Support Center. Work will be performed at the Naval Air Station (NAS) Jacksonville, Florida (90 percent); Seattle, Washington (2 percent); Tinker Air Force Base, Oklahoma City, Oklahoma (2 percent); NAS Oceana, Virginia Beach, Virginia (1.5 percent); NAS Whiting Field, Milton, Florida (1.5 percent); Marine Corps Air Station, Beaufort, South Carolina (1.5 percent); NAS Corpus Christi, Texas (1.5 percent), and is expected to be completed in January 2024. Fiscal 2019 working capital funds (Navy) in the amount of $5,000 will be obligated at time of award, none of which will expire at the end of the current fiscal year. This contract was competitively procured via an electronic request for proposals as a 100 percent small business set-aside; seven offers were received. The Naval Air Warfare Center Training Systems Division, Orlando, Florida, is the contracting activity (N6134019D0006). Tecolote Research Inc., Goleta, California, has been awarded a $7,718,193 firm-fixed-priced contract. The contract is to procure services for management of the Department of Defense’s cost data collection repository, the Cost Assessment Data Enterprise (CADE), used by analysts to develop cost estimates for major acquisition programs. Work performance will take place primarily in Arlington, Virginia; Goleta, California; and Tacoma, Washington. Fiscal 2019 operations and maintenance funds in the amount of $5,564,914; fiscal 2019 research, development, test, and evaluation funds in the amount of $1,216,061; fiscal 2019 Defense Acquisition Workforce Development funds in the amount of $680,218; and fiscal 2019 Department of Energy/National Nuclear Security Administration funds in the amount of $257,000 are being obligated on this award. The expected completion date is Feb. 2, 2020. Washington Headquarters Services, Arlington, Virginia, is the contracting activity (GS-00F-052CA).